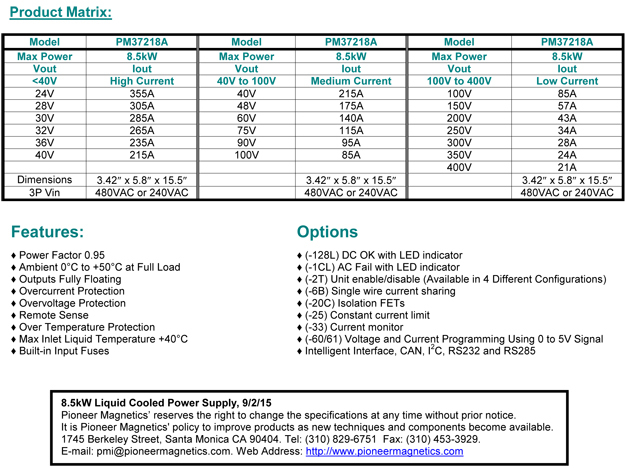 Pioneer introduces a new line of liquid cooled power supplies. The hallmark of this series is High Efficiency, High Power with full Output Power of 8.5kW with 3P AC input ranging from 365V to 528V with Nominal 480VAC 3P and 180V to 264V with 240VAC Nominal 3P. This liquid cooled product series support 0.95 PF with 3P Input and has Efficiency >90% for outputs greater than 40V at nominal line and full load. The liquid cooled series is designed to support both standalone and parallel configurations. The models are configured in standard I/O interfaces with quick liquid disconnects with no spill. The Premium Quality front ends are ruggedized and are reliable for high performance designed in a 2U compact package with dimensions 3.42" x 5.8" x 15.5". With Optimum power density of 27.64watts/in3, excluding the I/O interface and water connection, these units also have built-in protection from electrical over-loads and over temperature. Optionally, the units are designed with Intelligent Communication Interface using CAN, I2C, RS232 or RS485 Interfaces. A single unit provides continuous full power over ambient operating temperatures of 0°C to +50°C using an aluminum plate with 1/4" stainless steel barb for liquid cooling using 0.5g/m water flow at 40°C max inlet temperature. 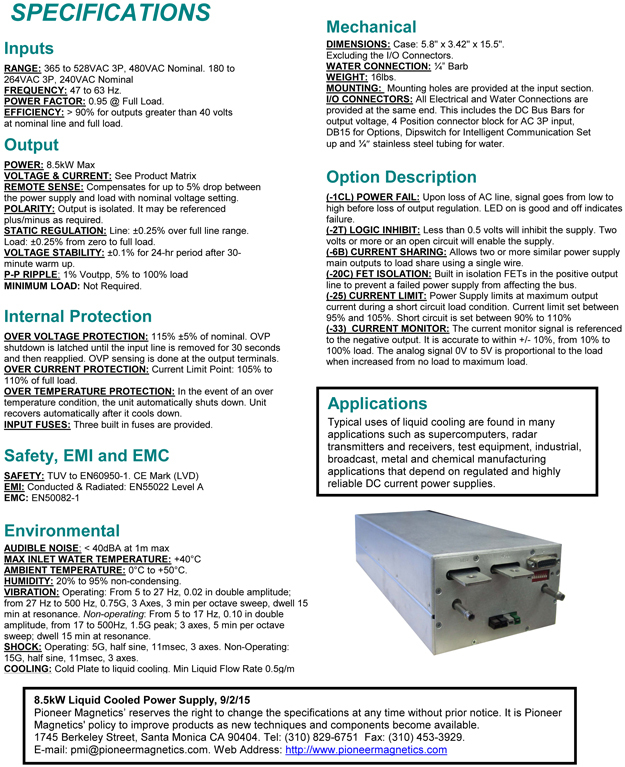 The 8.5kW liquid cooled unit is available in three different configurations depending on the selected output voltage as listed below in the Product Matrix.